At 62 Daredevil Nihang Singh keen to raise the bar. 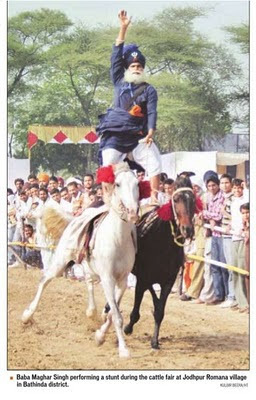 Astride two galloping horses, with one hand holding the reins and the other raised towards the sky, 62-year-old Baba Maghar Singh loves the audience's cheers every time he performs his daredevil act. The Nihang has showcased his talent in Aamir Khan starrer Rang De Basanti, besides several Punjabi films and music albums, but what he enjoys the most is performing before crowds in fairs. “While riding, it's very satisfying to hear the joyful shrieks of spectators,“ Maghar Singh told Hindustan Times. He was at Jodhpur Romana village in the district to perform during the zonal cattle fair organised by the state animal husbandry department. 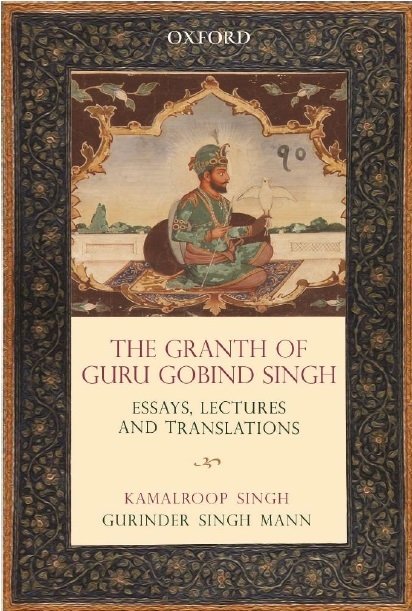 A native of Gurdwara Mastuana Sahib in Sangrur, he considers the fair venue his “permanent“ address.Maghar Singh, who performs without charging any fee, has had no formal or professional training. “With the blessings of Sikh Gurus, I have learned the stunts in Nihang “chhaunis“ (cantonments) at various places,“ he said. Even a major leg fracture, which he suffered while riding three horses simultaneously last year, has failed to dampen his spirits. After a six-month-long recuperation, the Nihang has set his sights on riding four horses in one go. “This is the dream I want to fulfil before I die. I want to enthrall the people of Punjab with this ultimate stunt. I have already started practising for it,“ he said. Maghar Singh, who has started a horse riding academy at Gurdwara Mastuana Sahib, wants to teach skills to rural youth.